On the monument in the Lincoln Chapel, at the south-east end of St George’s, at the feet of Elizabeth, Countess of Lincoln, appears an ape, standing on all fours. Elizabeth FitzGerald was the third wife of Edward Clinton, 1st Earl of Lincoln, whom he married on 1 October 1552. She was the daughter of Gerald FitzGerald, 9th Earl of Kildare, and the ape has appeared on the Kildare arms for centuries. But why should this be so? According to legend, in the 13th century the infant son of Maurice FitzGerald was snatched from his cradle by a tame ape. Carried to the top of the battlements of the castle, he was eventually returned by the simian to his cradle. Another version of the tale states that in the mid-13th century, fire broke out in the house and the infant first Earl of Kildare was forgotten in the panic to evacuate. He was said to have been rescued by the family’s pet monkey, and in recognition of the debt, a monkey was added to the family crest. The ape is traditionally a symbol of sin, malice, craftiness and lust. It is thought to have indicated a moral obligation on the part of the bearer to conquer all sins, and been a reminder of one’s morals, ethics and religion. 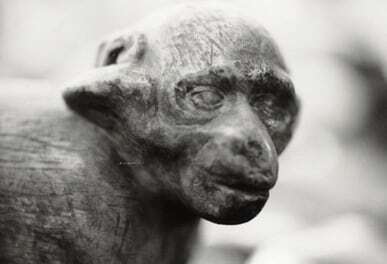 Other representations of monkeys appear in the grotesques, misericords and choir stalls in St George’s Chapel.